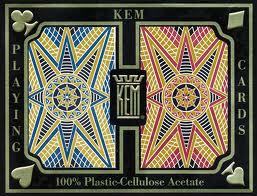 KEM cards are 100% plastic playing cards. These cards cost more than regular playing cards, but are actually a good buy, in that they last much longer than ordinary playing cards. 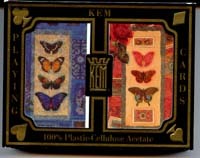 KEM Playing Cards are made in the USA. KEM is a registered trademark of KEM Plastic Playing Cards, Inc.